In this post we’ll look at making your own Batman games. We’ve posted about two other game creators provided by the Cartoon Network and this is the third and final game creator that they have to play with. 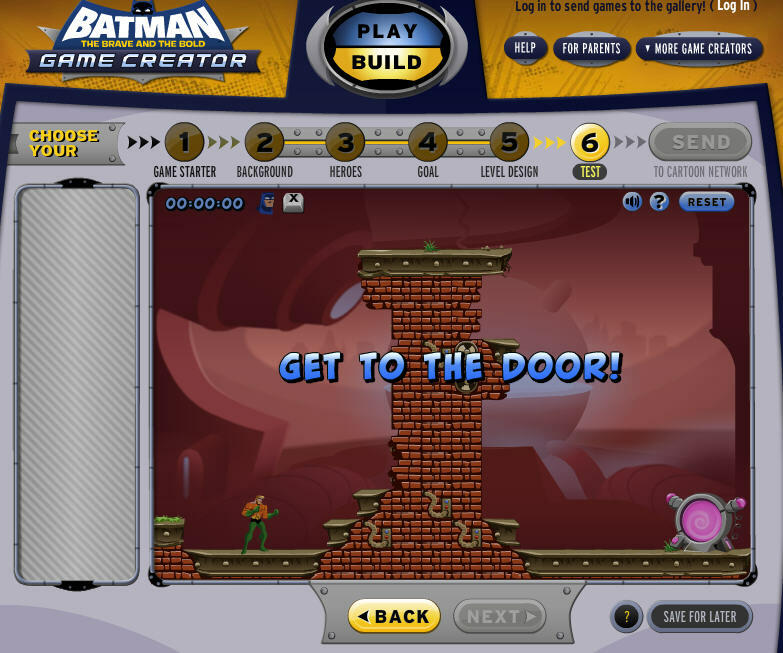 The Batman game creator is built in Flash and publishes games out to Flash as well which means it should also work on Android devices. 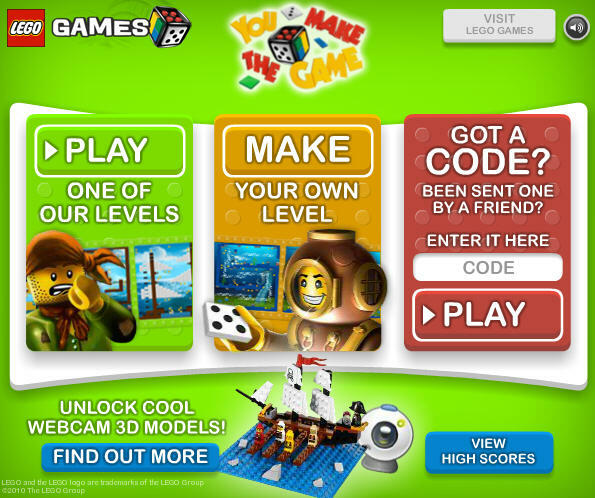 The other two game builders they offer are for Ben 10 games and Star Wars games. 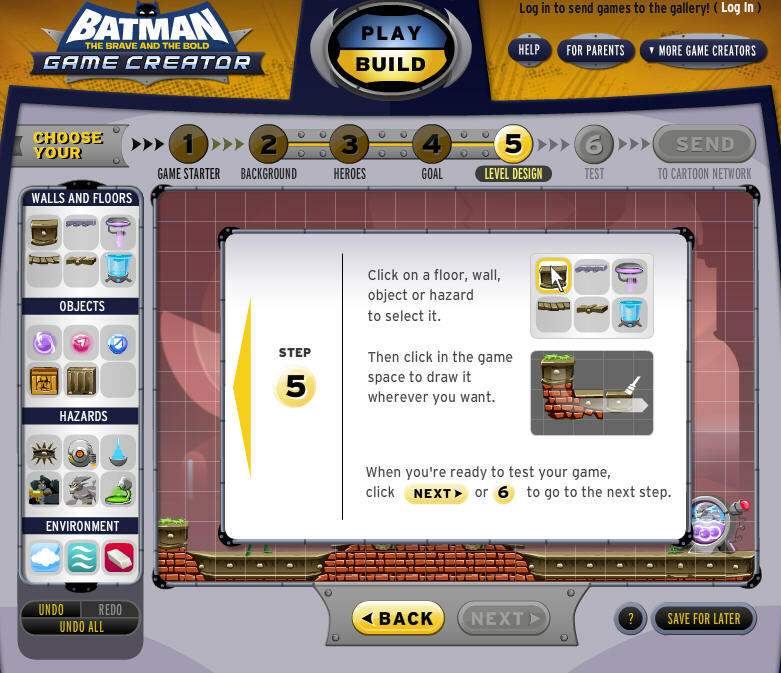 The Batman game builder is broken up into six easy steps which starts with the Game Starter section and ends with testing your game. 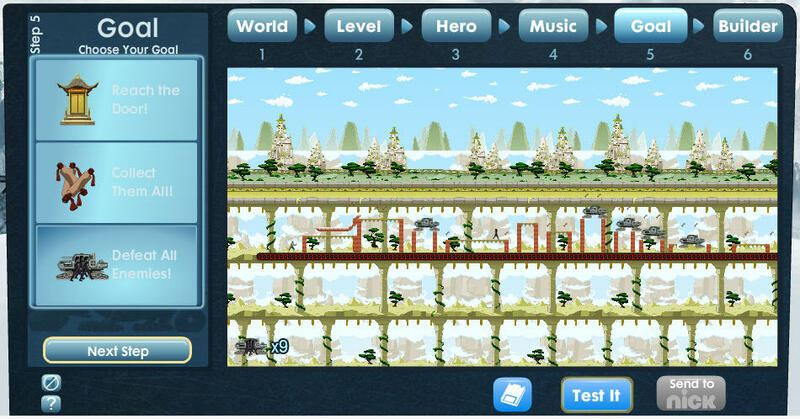 The steps are Game Starter, Background, Heroes, Goal, Level Design, and Testing. After all steps are complete you publish out your game for other people to play. Similar to all of the other game creators offered by Cartoon Network and Nick.com there is only about 5% customization available to the person creating the game. There is no ability to upload any custom graphics at all. 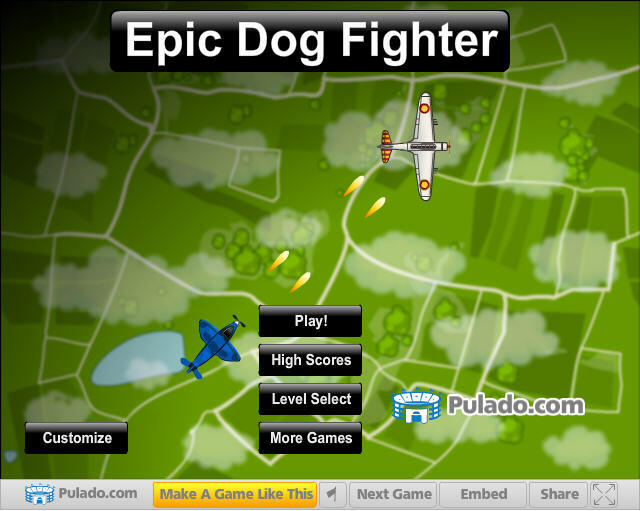 If you want a game creator that you can upload your own custom graphics you should make your own game with Pulado. In the Game Starter section you choose from a list of pre-created level designs to start your level with. Next up in the Background section you choose a background that goes with the game level that you chose in the Game Starter section. There are a variety of different colors which allows you to generate themes like underwater or in the forest or in a sewer. There are probably ten or so level setups to choose from in the Game Starter section and about the same amount of backgrounds to choose from as well. Once you have selected those two you can move on to the Hero section where you select your player character. You get to choose from Blue Beetle, Green Arrow, Aquaman, and Red Tornado. The character you choose becomes your main character and then you have the option during the game to switch your character main to Batman and back again using the X button (it is sort of a sidekick system). In the Goals section you can choose one of four goals which are Get To The Door, Collect All Orbs, Battle All Enemies, and Collect All Orbs And Battle All Enemies. They are pretty self explanatory and depending on which you choose it lets you place a door, enemies, or orbs throughout your level. When you first click it automatically places the items on the map so you don’t have to move them unless you want to. 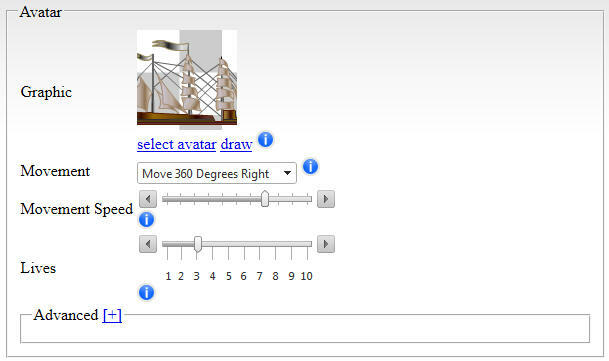 In the Level Design section there are different wall and floor sections you can use to customize your grid based map. You can also add additional hazards, and more objects like orbs. Lastly you can erase parts of your level and add water to your level for the character to swim through. Once you are finished with the Level Design section you can move on and test your game. If you aren’t happy with the result you can go back and continue to customize your game. That’s all there is to it. 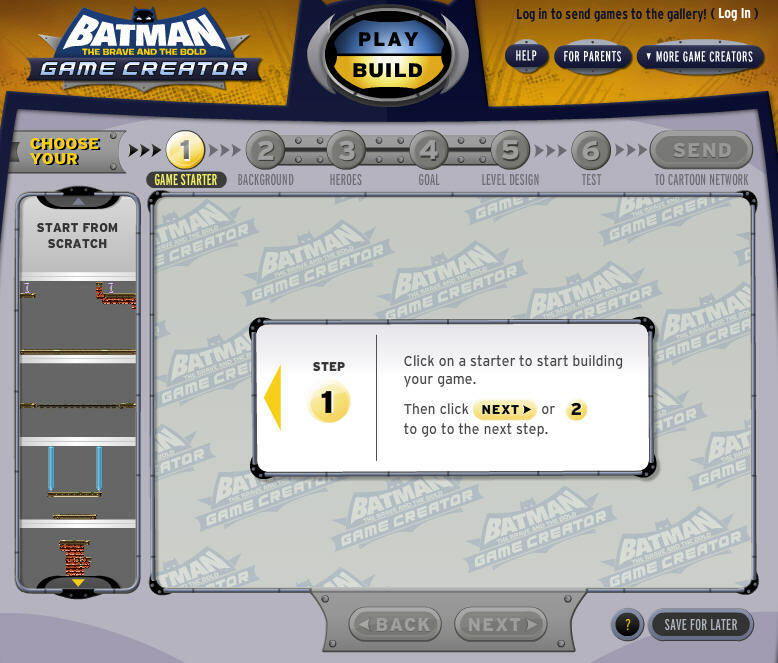 Once you are finished with your Batman game you can publish it to to their site for everyone to play. Go start making your own Batman game here. So here is another game creator from the Cartoon Network where you can build games based on the Ben 10 franchise. The other game creator that Cartoon Network has plugged into this same system are a Star Wars game creator and a Batman game creator. The Ben 10 game creator is probably the best of the bunch. 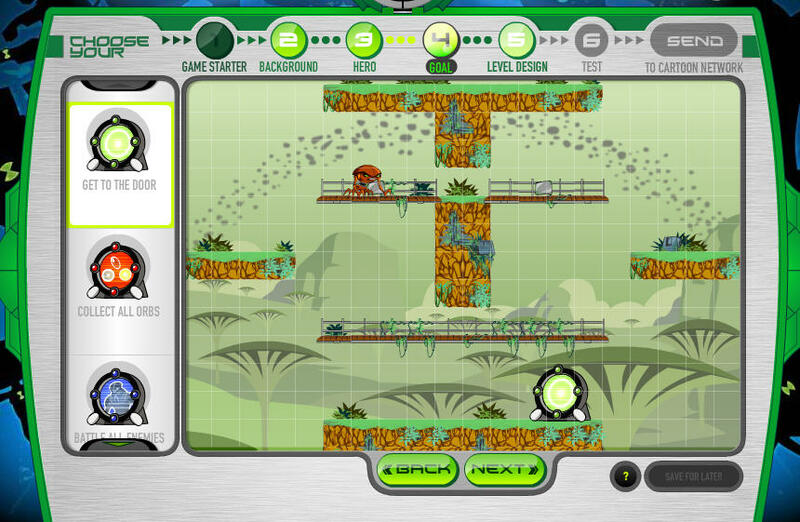 The Ben 10 game builder is built in Flash and publishes games out as Flash as well which means they can be built and played on Android devices. 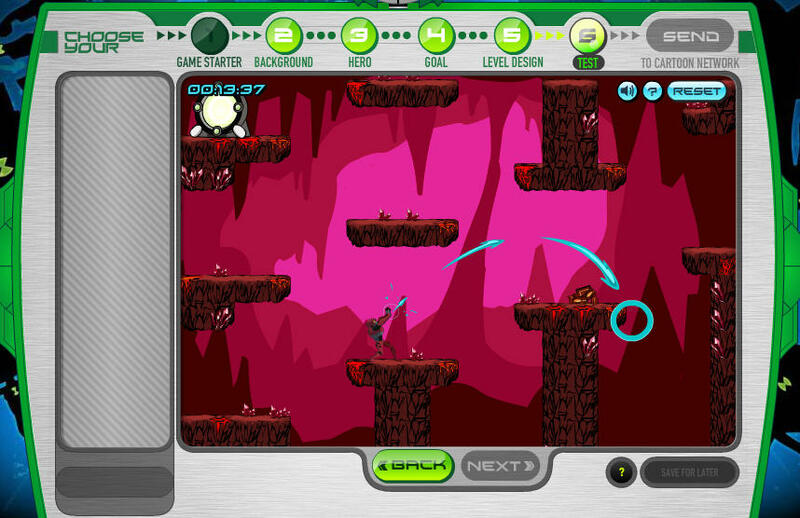 The Ben 10 game builder’s first option is where you can choose a pre-created level template from a list of different levels. There are quite a variety of levels in all different colors and configurations available. One interesting thing about it is that the levels are mainly contained within the viewable screen and don’t scroll off in other directions. This makes for a compact level which is easy to setup and tweak to your liking. It isn’t possible to add any custom graphics to the Ben 10 game builder but they do provide quite a variety of different hero characters, levels, and backgrounds. The Game Starter kind of sets the tone for your level because it has a color them too it. Then on the next step which is the Background section you can choose either a background with a matching color or a background with a contrasting color to make the level pop out at the player. The next step is where you can choose a hero character. 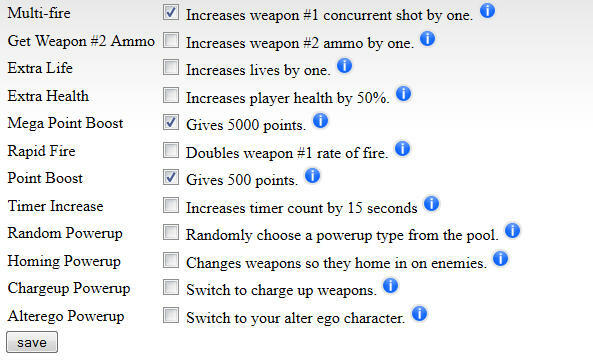 There are 10 different heroes to choose from in this game builder and that is a pretty big variety of different characters (if you want to build your own game and want to be able to upload your on custom characters you could try the game builder on Pulado.com). Each of the different hero characters have a different movement and fire characteristic so for example the spider monkey hero top shoots a web and can cling to walls. The next area is where you choose a Goal for your game from a number of different goals. There is “Get To The Door”, “Collect All Orbs”, “Battle All Enemies”, and “Collect All Orbs And Battle All Enemies” to choose from. When you choose Get To The Door you can choose where to place the door. 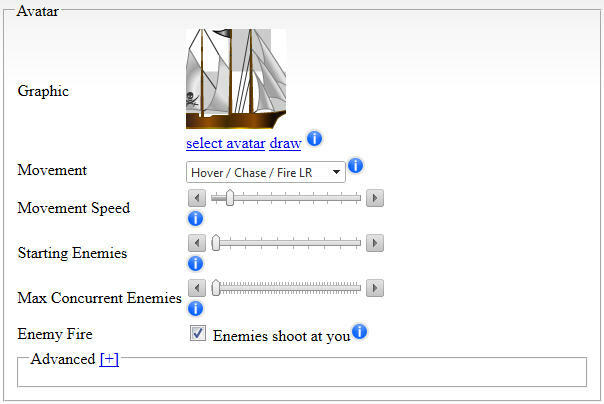 The other three options are similar and you get to choose where to place the enemies and the orbs. Moving on in the Level Design section you get to enhance the existing level design with various things like enemies, enemy spawn boxes, orbs that can be collection, lava, additional wall and floor pieces, and a few other items. It also comes with an eraser if you want to remove items on the map. And lastly you can test your map. That is all there is to it to build your own Ben 10 game with this game builder. Head over here and start building a game now. UMapper GeoDart is an easy way to make your own geography trivia games. They plug into a bunch of different map APIs like Google and Bing which you can then use via a WYSIWYG interface to create map trivia games. You can create the games using their Flash client and then the map games publish out as Flash games which means you can embed them around the web. 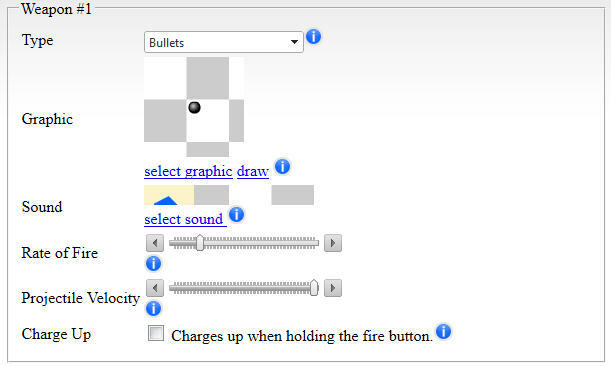 One other interesting thing they included was an Export To Actionscript button which gives you all the AS3 source code you would need to include that exact same map you just built into your own Flash game. Because the output for these games is in Flash you can also play them on Android devices but they also appear to have an HTML5 version which is embedable via an IFRAME. Using their game creator (which looks like it is built in Flex) you basically drag and drop points on a map and then you add names to those points and a question in the description field for that point. The game client will then ask that question of the user and it is up to the user to click on the map and find the point that the question asked about (an example would be Where is London? and then the user has to click in London on the world map to answer it correctly). You have a limited amount of time to answer each question (which is configurable). The closer on the map to the correct answer the more points you receive. 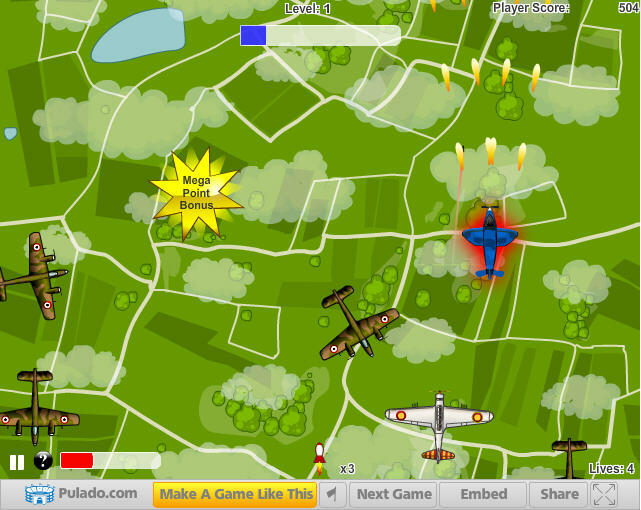 If you are looking to create a more interactive arcade style game you might build your own game using Pulado. Head over to UMapper GeoDart and start building your own geography trivia games by clicking here. Honey Nut Cheerios partnered with Nick.com to create their own “build your own” Honey Nut Cheerios game. It is in the same spirit as the game builders for Spongebob and iCarly that we have posted about before. 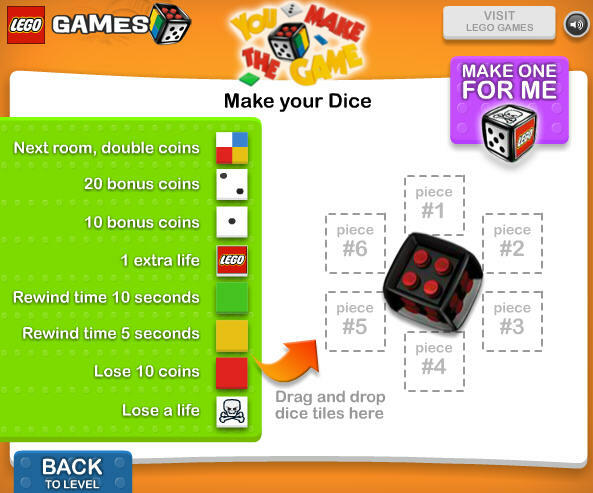 The game creator is built in Flash and outputs a Flash game as well which means it is playable on the web and on Android devices. I guess you could also build your own game with it on an Android tablet device. In any event the mechanics for building the games with the Honey Nut Cheerios game creator are pretty simple. There are 6 easy steps to building your own game with it but the drawback is that there isn’t any way to include your own custom graphics or custom anything really. They probably give you 95% of the game and you provide the other 5%. 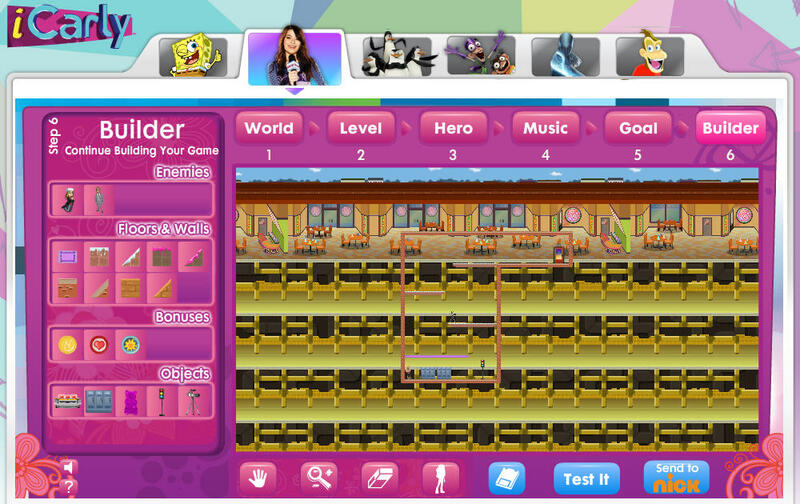 The game builder itself is broken up into 6 different tabs which are World, Level, Hero, Music, Goal, and Builder. 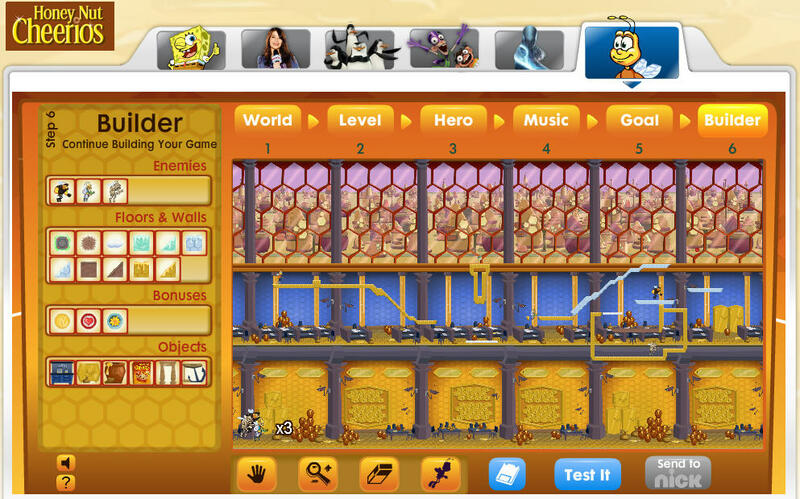 On the World tab you choose a background for your game where your bee will fly around. 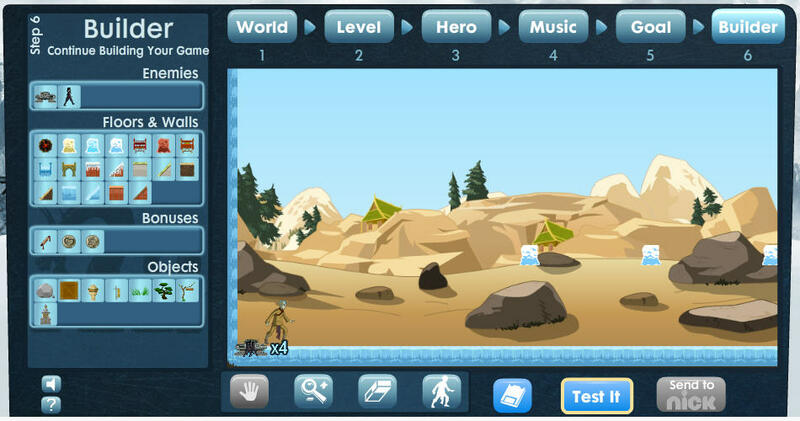 In the Level section you choose from one of 6 pre-created levels that your player can walk on. In Hero you choose one of three player characters (honey bees) that you play. Music lets you choose one of 5 music tracks to play in the background of your game. Goal is an interesting tab because it controls how and why people should play your game. You can choose one of three available goals which are Reach the Door, Collect them All, and Defeat All Enemies. Unfortunately as previously stated there is no way to add your own graphics but you could use the Pulado make your own games creator which allows you to do that (just not with Honey Nut Cheerios characters). Lastly on the Builder tab you can customize your level by adding or removing Enemies, Floors & Walls, Bonuses, and other random objects. One you’ve tweaked your game how you like it you can use the Test It button to go play your game and see if it is fun. If you have any changes you can come back and edit your game before publishing it live. 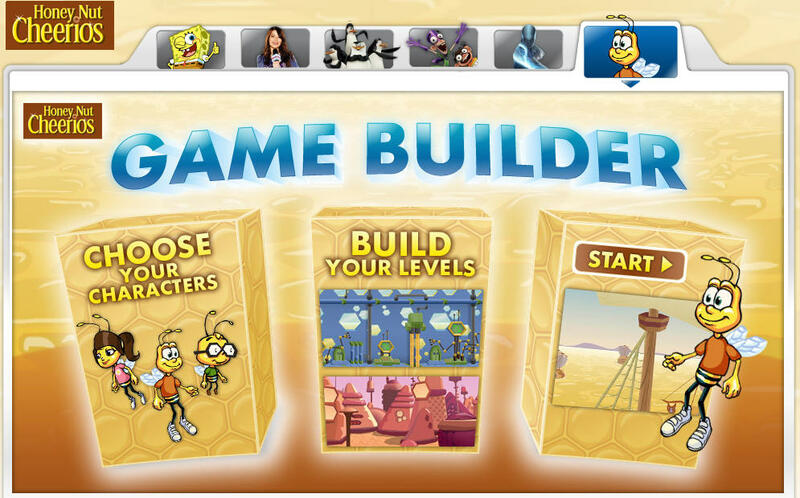 If you want to make your own game using the Honey Nut Cheerios game creator head here. Over on Nick.com they have a game creator where you can build your own iCarly game for free and then send it to other people to play. The kind of game that you can build is pretty limited but overall it is fun to try at least. 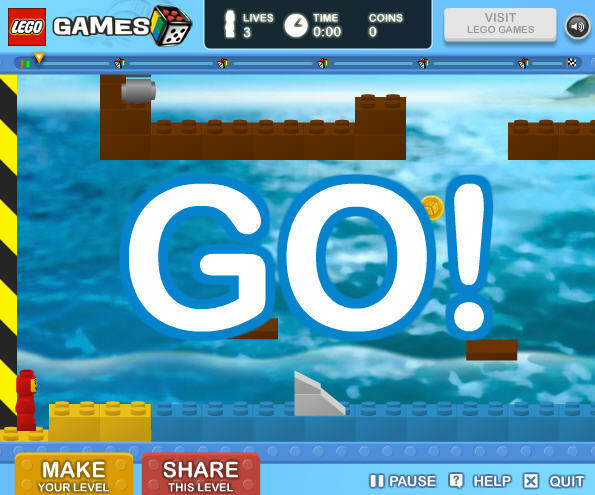 The games that you build in the iCarly game build are side scrolling platform games similar to Mario but it also is vertical than horizontal.This game builder is very similar to the Spongebob Squarepants game builder which is also offered by Nick.com. 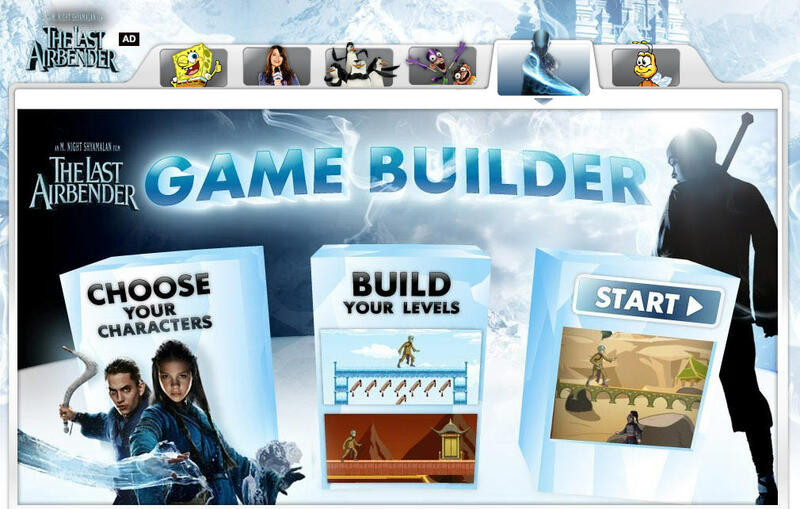 The game builder itself is built in Adobe Flash and it outputs to Flash as well which means you could build games with it on your Android tablet and you could also play the games on any Android device. Creating your game is broken down into 6 different steps. The first step is where you select your World which is basically what background do you want to use for your game. The next step is selecting the level itself. 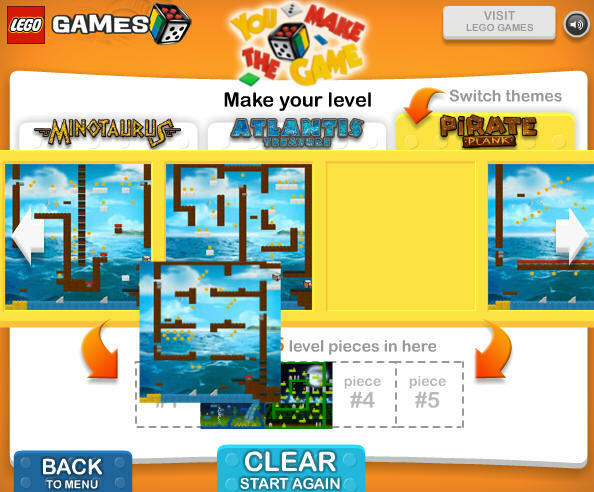 You can choose from a limited selection of pre-created levels. Maybe at some point you can also create your own levels instead of just choosing from 4-6 templates but that option isn’t available for first time users. After you choose your level template you move on to choosing your hero graphic and what music you would like your game to have. There are four heroes to choose from and five music tracks. Moving on you are now on the Goals section where you can choose what the player will need to do to complete the level. You can choose from “Reach the Door”, “Collect Them All”, and “Defeat All Enemies”. Lastly you end up on the Builder section where you can customize your level to some extent by adding in props, enemies, bonuses and extra walls if you want them. 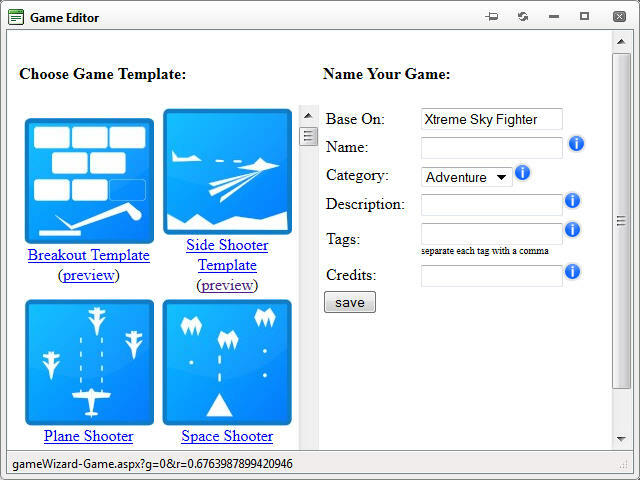 There is no way in this game builder to upload your own custom graphics or content which is pretty limiting overall (if you want a game creator were you can use all of your own graphics you can make your own games with Pulado). 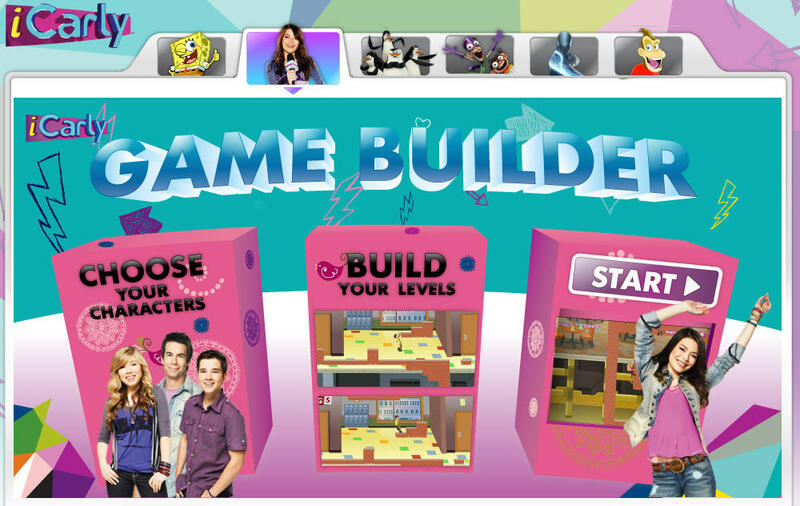 Over 52,000 levels have been built with the iCarly game builder which is a pretty big number of games. If iCarly is your thing or you just want to check out building your own game levels give this a go here! R-Type is a classic arcade game where you are a space ship flying in a side view and you blow up all kinds of enemy baddies. R-Type games are in the side scrolling shoot em up genre of games or shmup for short and they are also known as bullet hell games because there are so many projectiles flying around. In this blog post we’re going to show you how to build a similar game using the Pulado make your own games engine. 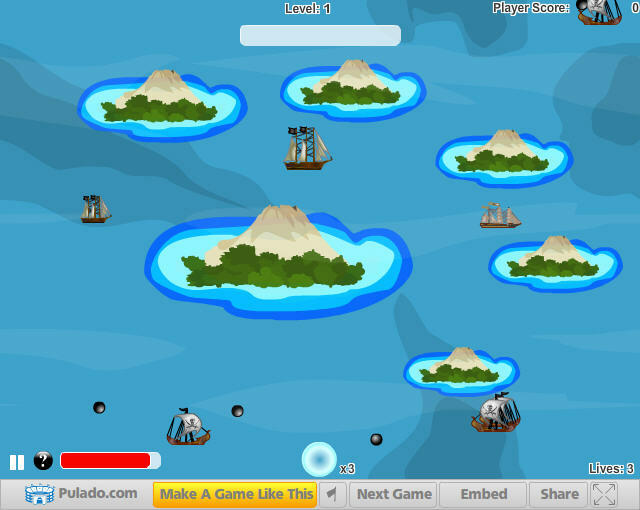 Pulado games can be built and played within the browser and use Adobe Flash as the game client. If you don’t already have an account head over to Pulado.com and create an account and then get to the members area. 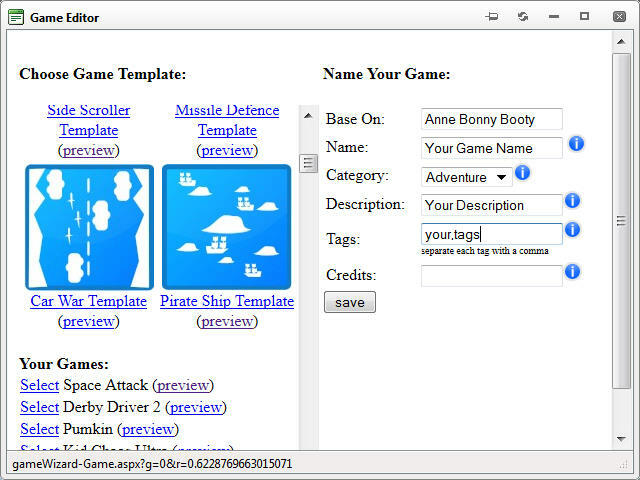 Once in the members are you should click New Game and then select “Side Scroller Template” from the template list. 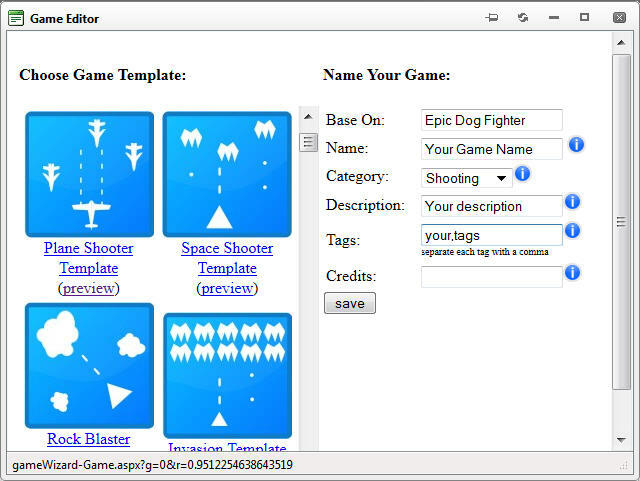 Fill in the name, description, and tags for your game in the relevant fields and then click Save. The theme of this template is WWII and not space but it is a side scroller like R-Type. The settings that make it this way are located in the Player Tab and the Opponent Tab mainly. 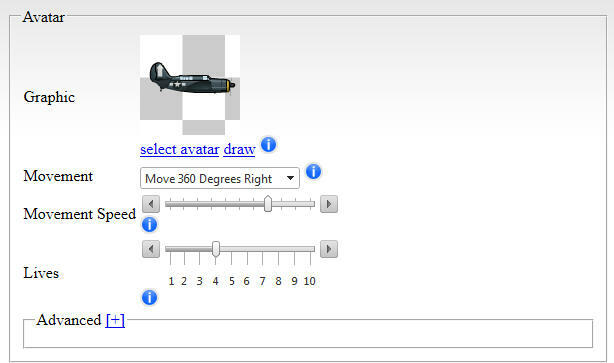 If you select the Player tab you will see where the player avatar graphic is configured but the main setting here is the Movement setting. 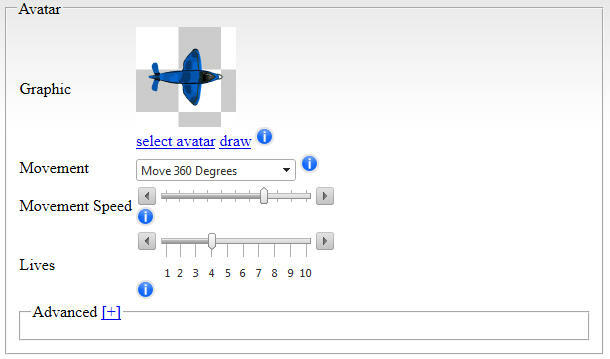 You want”Move 360 Degrees Right” which will allow your plane to move and fire to the right. 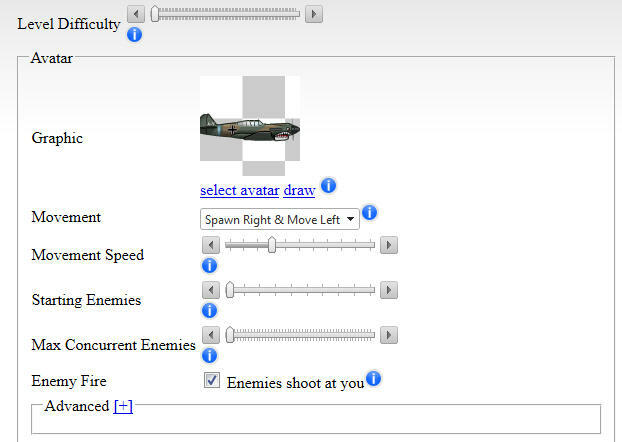 There are a lot of other settings here you can configure like the movement speed of the player and how many lives they should start the game with. 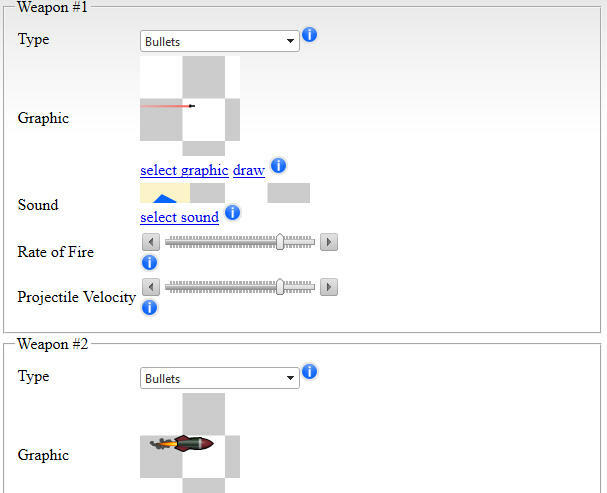 You can also scroll farther down and configure the Weapon #1 and Weapon #2 rate of fire, sound, graphic, and projectile velocity. There are other posts here which explain those features in more detail. On the Opponent tab you want to select “Spawn Right and Move Left” as the movement type. This will make the enemies spawn on the right side of the screen and fly to the left side of the screen (towards the player). They will also fire in that direction. 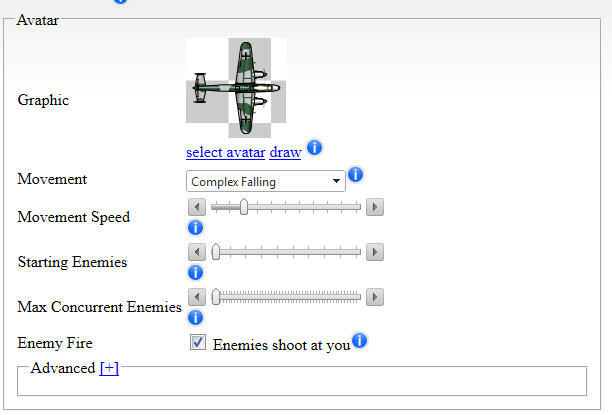 Also on this tab you can change the enemy graphics, the enemy movement speed, and the two weapons that the enemies can have. Additionally, you can choose to have multiple graphics for the enemies (it randomly picks a graphic to use for that enemy each time an enemy spawns). 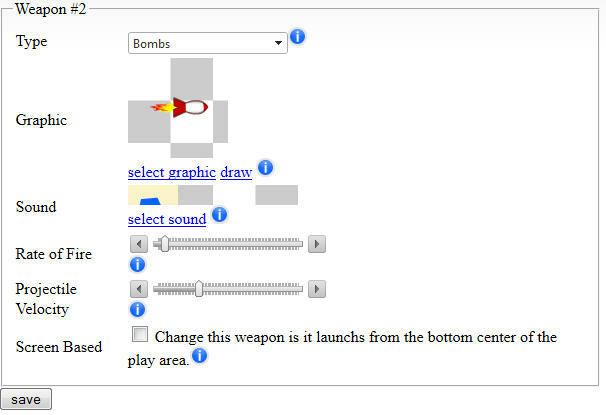 The weapons are is very similar to the player weapons area where you can set the rate of fire and the projectile velocity. 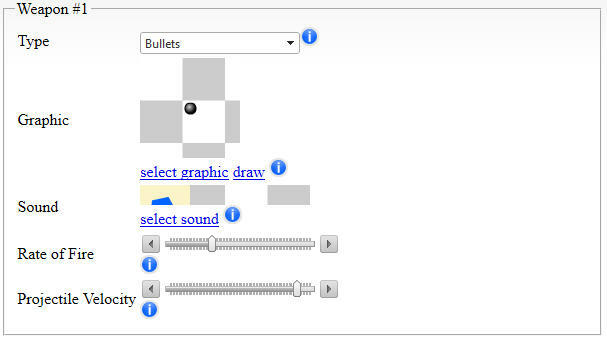 On the Background Tab you can setup the different background layers behind (and above) the player. You can also set the backgrounds to different speedswhich creates a parallax. The scrolling background is a signature feature of R-Type like games. 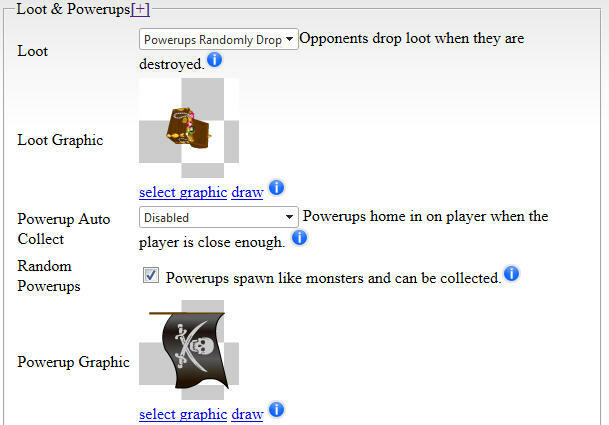 The other relevant tabs which you can also explore to tweak out your game are the Gameplay tab and the Powerup tab. On the Gameplay tab you can configure bosses, hitpoints, and loot among other things. 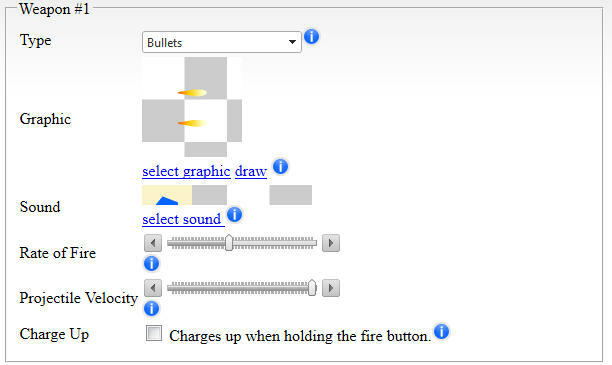 On the Powerup tab you can control which powerups will drop like Rapid Fire and Multi Shot. And that is all there is to it to start creating your own game like the classic R-Type side scrolling shoot em up. 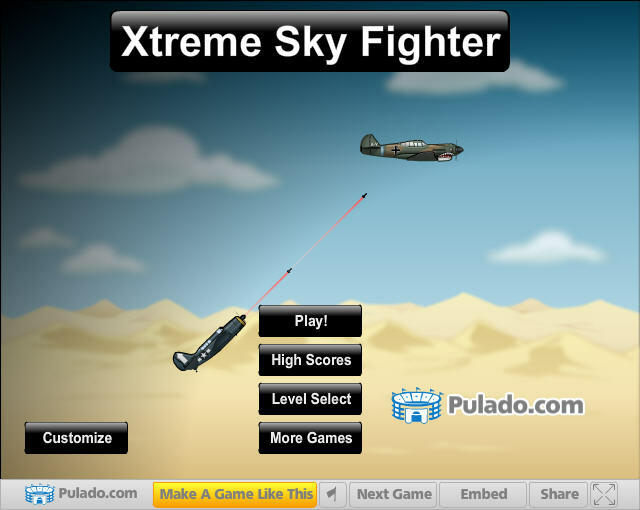 Head over to Pulado and start to make your own game now!